Many people these days just don't appreciate the power of globes. Unfortunately, many of these are children, but in today's social-media driven and Internet-connected world, globes provide a variety of vital cultural understanding advantages. Read on to find out why globes are meaningful today and why your child's access to one of these vital educational tools can be beneficial. It's old news, but it's not getting any better: children are failing at geography. As test scores continually plummet, many children struggle to point out their home state on a globe, let alone the countries around the globe that have been the center of so many current events. Globes can help boost your child's geography skills by giving them an accurate rendering of the world. This is especially true if you buy a more updated globe: while our school globes may have been useful to us in 1981, children are going to be confused by the inclusion of the Soviet Union, Eastern European changes and the renaming of other key areas. As mentioned many children suffer from is a lack of perspective on the current events that are shaping their lives. Simply put, they can't possibly grasp that impact if they can't visualize the location. And that's problematic: as these children grow into the leaders of the world, a lack of cultural perspective may lead them to inaccurate understandings. A globe will instantly give them a better grasp on these events by putting the world into perspective. For example, you could point out where countries are located in the middle east to give them a better understanding of where so many of our soldiers are located or have served their country. Beyond the impact a globe has a child's understanding of current events, it can also serve as a reminder of just how big the Earth is and the distance between various countries. For example you could point out China, a country that is almost literally around the world, and discuss how different life is over there for children their age. Next, point out more isolated locations, such as Australia or the Galapagos Islands, and teach them about the animals specific to their regions. Simply hearing about the Tasmanian Devil is pretty cool, but seeing where it makes its home (and how far that is from their home) will engage a child and create a more global perspective that can't be beat. If your child has traveled with your across the world or just the country, you can use a globe as a way to show where they've been. After all, sitting in a car or flying in a plane for hours doesn't give you an accurate perspective of the great distances you've traveled. For example, if you're from Maine and you drove your children to California, you can point out your route and indicate each state they've visited. Discuss the cities where you stopped and briefly remember what you did there to give your child a more thorough understanding of the nation. All right, this point isn't nearly as serious as the others, but it's still relevant. Globes simply look cool in any kid's room. They are large, round, colorful, and simply dominate the eye. If your child is looking for an immediate boost in room style, try a globe. Better yet, consider investing in one that lights up in the dark: these make cool reading lamps or night lights. Clearly, the world of globes is much more complex and emotionally powerful than one would have ever imagined. Their benefits are hard to deny, which is why you should feel free to contact us or visit our online store if you're interested in owning a globe. We offer a wide variety of style options that should be right for you and your home. Replogle has become one of the top makers of quality globes in the world while still making them affordable. They've also managed to create globes with beautiful, unique style and specific designs that appeal to every demographic. A surprising demo they cater to you perhaps didn't think existed any more for globe sales is men. While you may think men buying globes was a pastime done a century or more ago, it's never really gone away. You'd be surprised at how strong the market is for globes with masculine stylistic touches. If you want to buy the man in your life a globe, or if you're a man yourself and want to buy a globe for your home or office, Replogle makes globes just for you. It's proof of how diverse Replogle is now in globe manufacturing and what they offer everyone in better appreciating our planet. Take a look at our Top 5 Replogle globes for men, the unique features of each one, plus proper placements for them at work or in a home. The epic symbol of an eagle for freedom belongs to everyone, though when used in design, it's perfect for masculine tastes. When an eagle gets used as the base of a globe, it also becomes symbolic in other ways, including patriotism and reflecting love of wildlife. If you have a man in your life with both a proud sense of patriotism and a respect for eagles in nature, this globe makes for a beautiful gift. With the eagle made of resin, you have a durable and sturdy base made of cherry-finished wood that lets you place this virtually anywhere. For a man who wants to show off his patriotic pride, placing this on a conference table or on his desk in an office suite sets off an immediate impression. The globe itself is also impressive with raised relief so he gains a real-world perspective of geography. With political boundaries listed, it can invoke some interesting conversations. The Livingstone Globe is perfect for a man who likes tradition in his office or home globe. It resembles many of the globes he likely grew up with blue oceans and accurate colors representing the continents. At the same time, it has a masculine round wooden base so it looks perfect for his office suite if he has visitors often. Many people prefer a globe that looks exactly how earth gets seen from space. This one does the job and will always start conversations when a man has business associates visit him in his office. It's also perfect for reference on conference tables if planning international business connections. 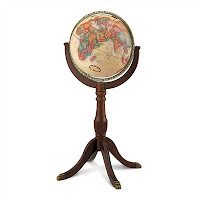 Another great globe with superior masculine design doubles as a place to store a World Atlas to complement the globe's use. With a cherry-finished base that's designed as a nook, a man can store an atlas in there for easy retrieval. Combined with this beautiful raised relief globe, it's yet another perfect gift for males truly interested in the world around them. As above, it's also a handy tool when planning international business associations and needing to understand more about each country. Sometimes a man wants a globe with a strong artistic sensibility like the eagle base above. On the Atlas Globe, it's a small-scale sculpture of the mythological character Atlas. He's the entire base on this globe with a dramatic pose of holding modern Earth up on his shoulders. The sculpture of Atlas has bronze resin materials for the ultimate in durability and class. Any man will love this on his desk at home, or for just proud display on a bookshelf in an office suite. It sets an immediate symbolic gesture about the challenges the world faces today. There isn't anything more masculine than leather, and this globe uses a two-toned leather finish on its surface for the ultimate in style. If your man has a leather obsession around his home office or at work, this complements it all exceptionally. Lest you think it's all style over substance, though, the globe itself is highly detailed and easy to use for global referencing. It's both an educative tool and a perfect element of interior decorating, which is a rare combination. Contact us here at Ultimate Globes to find out more about Replogle globes and the numerous styles they come in for any person or particular use. The idea of sailing on the seven seas have always carried a weight of mystery and mythology. For some, just the sight of the ocean can evoke that sense of wonder and longing. Captain Robert Gray commanded the first U.S. ship to circumnavigate the globe, and he discovered the Columbia River, which gave the U.S. claim to Oregon territory. Matthew Henson was the first African-American and one of the first explorers in history, along with Robert E. Peary, to sail into the icy North and reach the farthest point north on the globe on the North Pole. And the stories behind these achievements are remarkable -- full of wonder, adversity, triumph, and terrible tragedy. Like many of the American seafaring explorers of his time, Robert Gray began his adventures while serving in the military in the Continental Navy during the American Revolution. While working for a Massachusetts trading company, he captained the ship "Lady Washington," and then the larger vessel "Columbia." It was with these ships that Gray sailed from Massachusetts south past South America, around the treacherous Cape Horn where Atlantic meets the Pacific, and then up the South American coast to the Pacific Northwest, including California, Oregon, Washington, and Vancouver. After fur-trading, he sailed across the Pacific, stopping in Hawaii to rest (then called the Sandwich Islands), and then to a city called Canton -- now called Guangzhou -- in China. After trading with the Chinese, he continued west through the Pacific Ocean, into the Indian Ocean, around the Cape of Good Hope of Africa, and then across the Atlantic back to Massachusetts. He became the first American to circumnavigate the globe. His trailblazing prepared the way for future expeditions from other American explorers and merchants. During his exploration of the Pacific Northwest, he also discovered the Columbia River, which was named after his ship. When he returned to Boston, the citizens paraded Gray through the city to celebrate his accomplishments, and Governor John Hancock held a reception in Gray's honor. But it would not be the only time that Gray would circumnavigate the globe. According to Britannica: "after his return in July 1793, he spent the remainder of his career commanding merchant vessels along the Atlantic coast." He died at sea in 1806 near Charleston, South Carolina. His legacy, however, is not all parades and honors. Tragically, he attacked several native populations during his explorations of the Pacific Northwest. Some were in self-defense; but, as history records, some were not. In 2005, descendants of Gray apologized to the descendents of some of the natives that were victims at Gray's hands, as recorded by The Seattle Times. Matthew Henson, an African-American, was orphaned at age 11, and by age 13, he was a cabin boy on a ship. He learned to read and write on the ship, with the help of the captain. After 24 years of living a life of adventure on the sea, Henson met Robert E. Peary and joined the famous explorer on his first trip to the Arctic. Henson then roamed in the Arctic for seven years and logged 9,000 miles on dogsleds. In 1906, they tried and failed to reach the North Pole on a ship called the Roosevelt. "Henson and Peary boarded the Roosevelt with 22 Inuit men, 17 Inuit women, 10 children, 246 dogs, 70 tons (64 metric tons) of whale meat from Labrador, the meat and blubber of 50 walruses, hunting equipment, and tons of coal...and 130 dogs working to lay a trail and supplies along the route to the Pole." By this time, Henson was, in Peary's words, "more of an Eskimo than some of them." Henson had developed superb hunting and sled-driving abilities, and he could speak their language fluently. Contact us to explore our remarkable inventory of high quality globes that will inspire you and your family to learn more about American explorers -- and maybe embark on some adventures of your own! Perhaps you've never given thought to the idea that decorative globes make great housewarming gifts to those buying a new home. That's possibly because you've lost sight of what globes once provided for both establishing home decor and being a conversational tool. Both of those concepts still integrate well in homes once you see what globes can do to elevate interior design. Those who choose to bring globes into their homes as a decorative option adhere to the generational linkage globes provide. You've likely seen plenty of old pictures showing giant floor globes in Victorian-era homes and libraries. Globes were around even before that, including in paintings depicting aristocratic abodes of the 18th century or before. Even in those eras, globes had decorative uses and as points of conversation about the known world. Today, with satellite technology, globes are completely accurate with advanced informational markings so you get a better world perspective. While we sell globes with many special features for home or school use here at Ultimate Globes, we also want you to see the decorative possibilities. You can find some of this in our beautiful bar globes, as well as others that bring class to any room. At the same time, these globes guarantee starting conversations, which is what makes any housewarming party worth attending. You've never likely thought you could buy a globe with an embedded mini bar. We've offered these for a while, and they've become major hits as housewarming gifts. One reason is because of their varying styles, including an old world design that makes them look like nautical maps from the 16th century. If you have an interior design incorporating old world elements, these globes fit in perfectly. However, they look great even in modern designs as a creative way to contrast two different eras. They also become major points of interest once you reveal where the bar is. By simply opening the top section of the globe, you have access to a beautiful mini bar where you can store glasses and bottles. Many of them have sturdy bases on the bottom that allow you to store more bottles for easy access to your favorite wines or bourbon. As you and your friends sit down together for a drink, you can admire the detailed artwork these bar globes have. Almost all of these globes have antique frescoes inside, which any art aficionado will love. As such, you can have some refreshing discussions about the world and how much it's changed since the time depicted in these bar globes. With most bar globes portable, they're easy to place in a special location within your home. You can buy them from us at reduced prices, which isn't easy to find anywhere else. We carry many other globes here that help decorate a home to new aesthetic levels. Some of these include our popular gemstone globes where you can use a globe with different colors and in different contexts. The gemstones are beautiful enough, though you can find ones designed as bookends, paperweights, plus in floor globe style. Even traditional floor globes help add to traditional room designs seen in centuries past. You'll find floor globes that illuminate to help light a dark corner of a room. Or, you can find ones with different size bases with quality wood materials to match the color scheme of your surrounding furniture. All made with quality materials, you never have to worry about maintenance other than general cleaning. Contact us here at Ultimate Globes if you need to find a decorative globe for yourself or as a gift. You won't find a better place to find globes at affordable price levels, plus with the best globe makers in the world. When you're in the business of globes, not much surprises you. 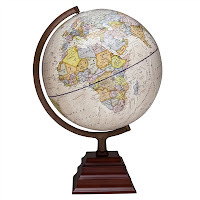 Here at Ultimate Globes, we all share a passion in the world of travel and maps, and we've all seen thousands of globes, from small children's globes to large, centerpiece-type floor globes. But the Diplomat Globe by Replogle is different from all of them. Start with the fact that it houses over 20,000 individually named places of interest on its 32-inch diameter, making it undoubtedly the most detailed globe in the world. Yet, it's still easy to read, thanks in part to its back-light and the political style of its borders. The detail available on the map is almost too impressive to describe it in a single blog post; indeed, you could spend hours looking at the Diplomat Globe and still finding new descriptions and places. Such a magnificent globe needs a fitting stand, so its cradle mount is almost as impressive as the globe itself. Handcrafted in the United States, it's constructed out of solid mahogany that stands 52 inches tall overall. The globe can spin freely left to right and vice versa, in addition to letting you "steer" it around its axis for full view of all parts of the earth. A brass meridian (also handcrafted, or course) allows you to determine latitude and longitude marks of the individual locations. Speaking of handcrafted: no part of the globe is mass-produced. Even the map itself is overlaid on acrylic by hand, a process that takes several day for each globe. Where do you place a masterpiece such as the Diplomat Globe? First, a reassurance: no matter what spot you choose as the home for this globe, it will attract the attention of anyone in the room thanks both to its size and its detail. That said, it works particularly well in reception rooms, offices and libraries, where its features are sure to be marveled at on a regular basis. We would be remiss not to point out one thing: be sure that the room you choose to be the home for this globe has at least a 32 inch opening, otherwise the globe - let alone the stand - will not fit. Of course, your location of choice may bring with them some needed adjustments. You may choose to place the Diplomat Globe in an area where no power outlet is readily available. In that case, we can custom-order the globe without its back-light for you, which eliminates the power cord at the bottom of the stand. Because of its handcrafted, limited nature, choosing whether or not you like the back-light feature is not your only option for customization. depending on your preferences. You can also order the globe in either a contemporary blue or an antique color scheme, the latter giving you a true maritime feeling. Over 500 years ago, the world's first globes were constructed to help seafarers navigate through the oceans. Their purpose was functional first and foremost. But what we love about globes is that since then, they have become so much more: they are pieces of art, sure to highlight the beauty of our planet and the creativity of their makers. Yet, they are still used in classrooms around the world to teach children about the planet they call home. This marriage of functionality and art is unique, and it's why we at Ultimate Globes love the business we're in so much. And more than any other globe we've come across, the Diplomat Globe combines both in one magnificent masterpiece. Its 20,000 named places and exact political boundaries are nothing if not educational, packaged in a handcrafted design that will enhance and beautify any space around it. In other words, it epitomizes why we're in this business. To learn more about the Diplomat Globe and to find the perfect globes for your needs, don't hesitate to contact us! Our nation's lore of American explorers includes a long list of names, but one of the most prominent names on that list is an American president, Theodore "Teddy" Roosevelt. "As president, Roosevelt provided federal protection for almost 230 million acres of land, an area equivalent to the entire Eastern Seaboard from Maine to Florida. He sat aside 150 national forests, the first 51 federal bird reservations, five national parks, the first 18 national monuments, the first four national game preserves and the first 24 reclamation, or federal irrigation, projects, designations that were bitterly opposed by commercial interests. Roosevelt also appointed as the first Chief of the U.S. Forest Service the visionary Gifford Pinchot, who shared his philosophy of natural resource conservation through sustainable use, and he convened four study commissions on conservation for policymakers and leading authorities to shape thought about the then-new field of conservation." Through the 1906 Antiquities Act, Roosevelt set aside 800,000 acres in Arizona, and this became the Grand Canyon National Monument. The Act also brought Yosemite under federal control and created the Yosemite National Park. The Act also included Crater Lake in Oregon and the Anasazi ruins at Mesa Verde, Colorado. These are only a few of the many national monuments, wildlife refuges, and national parks that Roosevelt protected for future generations with his Antiquities Act. Although a cataloging of Roosevelt's lifetime adventures would be far too numerous for one article, the shape of his life can be summed up in one sentence: Teddy Roosevelt saw and experienced enough wonders and adventures to fill two or three lifetimes. Besides exploring the American West, Roosevelt spent considerable time in Africa exploring, collecting scientific specimens, and hunting (not for pointless sport, but to collect specimens for naturalists) in the savanna. He also spent time adventuring in Brazil's rainforests. He also had a remarkable military career, in which he built up America's navy and formed the famous Rough Riders volunteer troop that became known for their famous charge up Kettle Hill in Cuba. Among his many international contributions, he was responsible for making the Panama Canal possible. In 1904, he commanded the canal to be built and, as PBS notes, Roosevelt ordered them to "make the dirt fly" to complete the work as quickly as possible. The Canal transformed the world because it joined, for the first time in history, the Pacific and Atlantic Oceans. Before the Canal, merchants had to travel around the deadly Cape Horn at the bottom of South America to complete trade routes. According to the New World Encyclopedia, John Wesley Powell made some remarkable first-time explorations of some of the most famous landmarks in the American West. Although Roosevelt was the one who preserved the Grand Canyon as a national monument, John Wesley Powell was the first person to explore the Grand Canyon. In 1869, he led a three-month trip down the Green River and the Colorado River. This famous trip led Powell through the depths of the Grand Canyon. Through these remarkable journeys, Powell would publish scientific account, make land utilization recommendations to the government, and propose irrigation projects. His reports were influential and helped form the conservation policy that would ultimately preserve the American West for future generations to explore and marvel at, just as he and Teddy Roosevelt had done with great joy during their lifetimes. Contact us to explore our beautiful collection of globes that will have you dreaming of your adventures into the wild blue yonder. "It's not easy to see how the more extreme forms of nationalism can long survive when men have seen the Earth in its true perspective as a single small globe against the stars." Fortunately, globes have been around long enough to help us have hundreds of years to look at the world from an omniscient perspective. Today, globes have become sophisticated enough to bring accurate representations and give you the feeling of being able to see the world from fresh angles. You can argue we all need the above as the world continues experiencing turmoil, even if it seems so distant when we see earth from satellite images. Globes provide the same kind of awe while also helping us get our bearings on where we are in relation to other places. If you've lost sight of what a globe can do for your household, consider the history of globes and what they did for generations of kids and adults. Also consider the advances in technology that now allows many globes to have a more interactive approach to learning about our planet. Here at Ultimate Globes, we want you to understand why globes are still meaningful today for both the home and the office. frequently see them in old homes turned into museums. In past eras, some floor globes were overly large, which only makes them more impressive to look at now. It's common to see those same globes passed on to other generations within one family. Globes are simply one of the few centuries-old items in the world that never go out of style. While many old globes are still beautiful, current ones from globe makers like Replogle add new features to help provide both education and entertainment. Here at Ultimate Globes, you'll find many Replogle globes where new technologies allow for student interactivity. Students can learn about more than just continents and cities around the world. Interactive globes provide fascinating world facts and figures that even adults may not know. What makes globes even more meaningful is they aren't just for kids. We sell various globes designed for adults. Some of them are customizable to use either as a desktop model, or for use in a living room as part of your interior decorating. In the latter case above, globes have meaning beyond just education. They work as outstanding decorative pieces thanks to specialized versions available on the market. You can find numerous globes now that exist for decorative purposes, which can become a major conversation starter during a party in your home. Or, these work just as well in an office suite where the globe can double as a business reference tool and a decorative piece. These decorative globes come in various styles, though you'll love the ones adorned with gemstones. It's a popular stylistic preference designed to increase the value of a globe, plus proving how easy they are to integrate into a household. Many modern floor globes even have decorative bases that are durable and stylish to match any classy decor. Contact us here at Ultimate Globes to remind yourself why globes are still meaningful today for your family in any environment. Take a look at our inventory with designs for all tastes. Home decorating requires more than a general idea of what things should look like. Carefully-chosen elements, ranging from the main backdrop of the walls all the way to small accents, turn the house into the showplace you envision. At every stage of the project, you should think of how a planned change will affect the whole. This way, you'll get an end result where all of the elements work together to create the desired effect. This style is often seen in movies, but it also works in real life when the room is large enough. A big globe sends a signal that its owner is either a world traveler or wishes to be one. People can generally expect the owner to know more about foreign countries than the average Joe, but this knowledge is likely to be of the type a vacationer will find interesting than of a political bent. If the large globe is designed in an old-fashioned style, it will lend a historic look to the room and increase the classiness of the area while a modern style invites people to spin it to see areas of interest. Either way, it will lend elegance to the room and give the impression that its owner is unique in a good way. To take these globes up a level from their already-impressive basic states, try getting one with an enhancement. Internal illumination is great for people who want to easily read the names of the countries and geographic features, while the hidden bar version is perfect for those who like the idea of keeping the liquor close without keeping it obvious. The placement of these globes has much to do with the impression they make. When placed on out-of-the-way accent tables, it's clear that they're there mainly for show rather than actual usefulness. This is fine with decor styles that replicate ones strongly associated with foreign countries, and will enhance the effect of the main design. On the other hand, globes that are placed in spots that imply that they are actually used, such as desktops or coffee tables, silently show that their owners have some sort of practical interest in at least some of the countries shown on these orbs. The interest may be political, have something to do with family history, or even be as down-to-earth as visualizing shipping lanes. In any case, asking about these globes may result in the guest being regaled with stories. These can be dotted around the room in places where there isn't enough space for larger ones. They can be traditionally-styled, modern, or even whimsical. The specific style chosen will determine the overall effect, so it's worth taking the time to consider the options when decorating with globes of this size. This is made even more important by the fact that many of these world globes serve dual purposes. For example, there are gemstone-accented paperweights, bookends that split the planet down the middle, and even a style that sits in a sculpture of a hand. 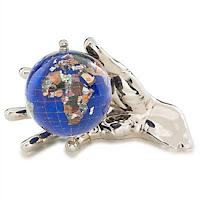 The concept of holding the world in one's hand is a popular one, so it's no wonder that this option features a globe sized to fit in your hand as easily as it fits with the sculpture. To see specific examples of globes of all styles and sizes and buy one of your own, just visit our online store. Feel free to contact us or visit our online store with any questions or to get more ideas for decorating with globes! After several centuries of globes helping people understand the world better, interactive globes for kids have become available as a way to modernize globes as we knew them. While traditional globes are always popular here at Ultimate Globes, we know that any child in the world can have a more enhanced learning experience with some digital interaction. As the world becomes more complex, it's important for our newest generation to fully comprehend what they face. The beauty of interactive globes is that many of them have features for learning specific subjects in-depth. They're perfect for a school class on geography, or on your child's desk in their own room. Also, we can't just hold to the idea that these interactive globes are for kids. Adults can learn just as much from them, especially if your own geography knowledge has slipped since you've been to school. Take a look at many of the interactive globes we carry from top globe makers. You'll find many of the features they use go beyond just identifying places on earth and into our world as a complex place. This includes planetary science from the perspective of space. When the older generation sees some of these interactive globes, they'll wish they had the same thing when they were a kid. Even if it's fun to look at a well-made traditional globe, having an interactive pen you can use to identify facts and figures makes for true fun while learning. A good example of the above is an interactive globe from Replogle called the Intelliglobe that uses a wireless pen to point out interesting aspects to earth that are quite thorough. You'll be surprised at how much your kids learn from this while going beyond identifying continents and major cities. This globe takes your kids on a complete journey around the globe with facts covering everything from history to ecology. It even provides fun trivia games to challenge their intellect. Many of the facts provided are things that even you could learn from while your child is away in school. Thanks to better technology, the voices on the globe are in digital format so your kids can understand each word. It's not just voice, but some versions include international music and other sounds to give a complete understanding of cultures around the world. You basically have a complete geography course all in one globe. Other interactive globes on the market let you see the world from a more scientific point of view. Some of them (like the Safari Children's Globe) teach your kids about all of the animal species found in certain parts of the world. This one has illumination as well, which is a fun feature you'll find on a lot of interactive globes. These globes go beyond just earth's surface. You'll find some that connect earth's role in space and identifying stars, or our relation to the sun. Our illuminated orbiter and solar system simulator are top sellers because they give fresh perspective on the planet's role in the universe. Other globes literally open up so you can see what's inside our planet, which is something older globes didn't always allow. Contact us here at Ultimate Globes to learn more about how interactive globes can help your children learn on a new level. Don't be surprised if they start teaching you a few things about our world for your own benefit.